US President says he aims to hold second summit with North Korean leader after the November midterms. US President Donald Trump told reporters Tuesday that he aims to hold his second summit with North Korean leader Kim Jong Un after the November midterms. "I just can't leave now," said Trump, according to The Hill. The comments come several days after Secretary of State Mike Pompeo met with Kim in Pyongyang. The two had a conversation that Pompeo described as "good, productive" toward Pyongyang giving up its nuclear capabilities. "As President Trump said, there are many steps along the way and we took one of them today," Pompeo said of the meeting. "It was another step forward." After he left the meeting, Pompeo told South Korean President Moon Jae-in that Kim is ready to meet with Trump "as soon as possible," according to Moon's office. 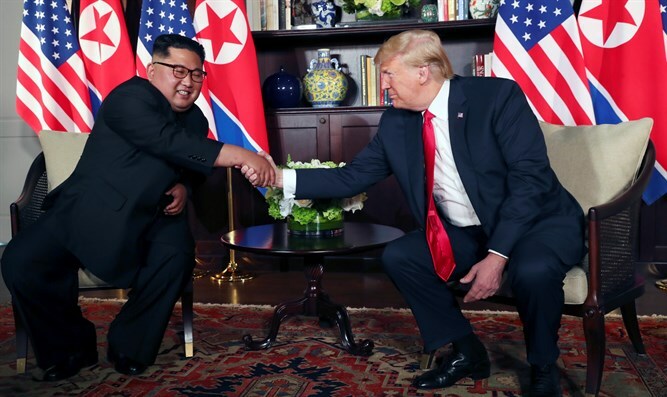 Kim and Trump held a summit in Singapore in June, during which they signed an agreement which includes a commitment to achieve total denuclearization of Korea, with promises to pursue “vigorous negotiations” to that end. Subsequent reports suggested, however, that despite its commitment to denuclearize, North Korea has continued to expand infrastructure at nuclear and missile sites. Trump then called off a planned trip to North Korea by Secretary of State Mike Pompeo, though he later insisted the United States is “doing well” in its diplomatic efforts with North Korea.